WCFG's Board of Directors includes Eric O'Keefe, a right-wing political operative with deep ties to the Koch brothers, and who helped form groups including the Franklin Center for Government and Public Integrity and American Majority. WCFG is led by RJ Johnson, a close Walker ally, who was a top campaign advisor to Scott Walker in his 2010 election and his 2012 recall race. WCFG registered with the Wisconsin Department of Financial Institutions on August 24, 2004. Documents released on June 19, 2014 detailing the allegations made by five county district attorneys into Scott Walker's political spending suggested that some of Walker's top campaign aides directed the political spending of outside non-profits, including Wisconsin Club for Growth. Under Mr. Johnson, the Club for Growth become “a hub,” according to prosecutors, for coordinating political spending by the Walker campaign and an array of outside groups. These ranged from the Republican Governors Association to Americans for Prosperity, the conservative advocacy group co-founded by the billionaire industrialist David H. Koch and financed by the political network overseen by Mr. Koch and his brother Charles. In one instance, prosecutors say the Club for Growth transferred at least $2.5 million to the state’s leading business trade organization, Wisconsin Manufacturers and Commerce, which in turn ran advertisements supporting Mr. Walker. During the same period, an official at the trade group joined conference calls with Mr. Walker and others regarding election strategy. "Wisconsin Club for Growth's top "advisor," R.J. Johnson, is a close Walker ally and the former Executive Director of the Republican Party of Wisconsin. In Walker's soon-to-be-released book, Unintimidated, the governor refers to Johnson as a friend of more than 20 years and his key campaign operative. While the Wall Street Journal editorial notes that the John Doe inquiry may be looking into illegal coordination between independent groups and political campaigns, it fails to mention that Johnson is an advisor to both Walker's campaign and Wisconsin Club for Growth." "For two years, Governor Scott Walker was caught up in an earlier John Doe probe into political corruption during his 2010 campaign for governor. Although the Wall Street Journal describes the previous John Doe as having "turned up nothing on Mr. Walker and embarrassingly little else," the probe netted six criminal convictions -- including three Walker aides, one political appointee, and one major campaign contributor -- for a variety of crimes including embezzlement, campaign finance violations and political corruption. That probe closed in March, but the new inquiry is following up on leads uncovered by that earlier investigation." CMD also uncovered how WCFG was at the center of a "dark money web," where the "group took in funds from some of the top Republican donors and Koch-connected dark money conduits in the country, and in turn shuffled millions to other organizations that spent money on ads in 2011 and 2012, all while keeping Wisconsin voters in the dark about the true source of the funds." Under Wisconsin's John Doe statute, proceedings are behind closed doors in front of a judge, much like a Grand Jury (but without the jury) and under strict secrecy orders. In November 2013, just weeks after the first subpoenas were issued in the John Doe investigation, Wisconsin Club for Growth director Eric O'Keefe broke the secrecy order and told the Wall Street Journal editorial board that he received a subpoena in the probe. O'Keefe told the Journal that some of the targets "had their homes raided at dawn, with law-enforcement officers turning over belongings to seize computers and files." “The subpoenas don’t spell out a specific allegation, but the demands suggest the government may be pursuing a theory of illegal campaign coordination by independent groups during the recall election,” the unsigned Wall Street Journal editorial stated. Stephen Moore, a founder of the national Club for Growth organization, is on the Wall Street Journal editorial board. See the Wall Street Journal article. (Copyright Dow Jones & Company Inc. all rights reserved). Milwaukee District Attorney John Chisholm announced on April 18, 2016 that he would run for re-election; the primary was August 9th. Chisholm's Democratic primary challenger was Verona Swanigan, an attorney and Milwaukee native who was new to electoral politics. Swanigan holds a law degree from Northern Illinois University (2005) and had practiced law out of her own firm, Swanigan Legal Services, for about a decade. She registered her campaign in August 2015 and released a video announcing her candidacy in November that focused on reducing crime and addressing domestic violence. Swanigan is an African American who has participated in community rallies calling on the U.S. Department of Justice to investigate police brutality. She calls herself a "conservative democrat," but her campaign was backed by well-known GOP political operative, Craig Peterson, who has worked closely with Wisconsin Club for Growth's Eric O'Keefe on efforts to reshape Milwaukee politics in recent years. According to news reports, Peterson has long been associated with Zigman Joseph Stephenson, a public relations firm, but has had financial troubles in recent years. Peterson has ties to former Assembly Speaker Scott Jensen, who was caught up in the "Caucus Scandal," an earlier John Doe prosecution of campaign finance abuses, and who now works for big money groups trying to privatize public schools. Peterson had reported $250 in monetary contributions and $1,681 worth of in-kind contributions to Swanigan's campaign as of December 31, 2015, a substantial part of the campaign's $5,476 total take for the year. Milwaukee scribe Bruce Murphy of Urban Milwaukee reported that Peterson was "clearly preparing to go after Chisholm." In May of 2016, Judge Lynn Adelman dismissed a civil case brought by former Scott Walker aide Cindy Archer in July of 2015. Archer filed the law suit against John Chisholm, the Milwaukee County District Attorney, alleging that he and his team did not properly conduct a search of her home and "carried out a campaign of harassment and intimidation" during the investigation of a handful of Walker's aides in the John Doe I probe. Adelman stated in his ruling that authorities did have probable cause to execute a warranted search of Archer's home and added that the lawsuit itself was groundless because the law protects prosecutors, like Chisholm, from litigation of this sort. "The subjects of the investigation... had significant resources and were willing to bring numerous lawsuits in an attempt to shut the investigation down. It is not an overstatement to say that the opponents of the investigation made it very difficult for the defendants to proceed." "I will not interfere with the state Supreme Court's order that the defendants turn over all John Doe II and relevant John Doe I documents to its clerk. I will, however, allow the defendants, if they wish, to file copies of such documents with the clerk of this court. The clerk will not docket the materials and will maintain them under seal. When this litigation is concluded, the materials will be destroyed." Archer's attorney in the case, David Rivkin from Washington D.C. law firm BakerHostetler LLP, said in May 2016 that he would seek to appeal the verdict handed down against his client. "The parties have filed a settlement agreement today in Waukesha County Circuit Court ending this unnecessary and baseless lawsuit and saving taxpayers additional legal expenses. The agreement contains no admissions of wrongdoing or liability by the Board or its staff, nor will the Board pay any of the plaintiff's legal costs." "This agreement vindicates the Board's involvement in the investigation. More importantly, it ends this frivolous assault on the actions of the agency and stops the drain on taxpayer funds used to defend this action." The Government Accountability Board said that regardless of this agreement, they would continue to stay within legal bounds for all investigations in the future as they have done in all past investigations. They added that, had the same settlement been made before the John Doe II, it would not have impacted the way they handled the cases. Edward Greim, the atorney representing Eric O'Keefe and the Wisconsin Club for Growth in the case, said that the settlement "will establish a precedent that will keep future incarnations of the GAB from doing what the GAB did." Greim also mentioned that the settlement dictates the release of some 40,000 documents held by the board that he believed would reveal the GAB's "true role in the John Doe investigation." The investigation is officially a five-county effort, involving five District Attorneys, from both the Republican and Democratic parties. A 2007 law pushed by Republicans requires that campaign finance violations be prosecuted in the counties where defendants reside, and prosecutors across the state have agreed to participate, finding that the investigation has both legal and factual merit. Would Republican prosecutors have agreed to participate in a criminal investigation into Republican leaders that was legally baseless or motivated by anti-Republican sentiment? The investigation was unanimously approved by Wisconsin's Government Accountability Board (GAB), which consists of a bipartisan panel of retired judges appointed by the Governor and confirmed by the Senate. Because the GAB does not have authority to prosecute criminal violations, it turned the statewide investigation over to the county district attorneys. Wisconsin's Republican Attorney General, J.B. Van Hollen, was asked to lead the probe. In declining the offer, Van Hollen neither rejected the legal premise of the investigation nor criticized it as a politically-motivated witch hunt -- he instead cited a conflict of interest. The Special Prosecutor leading the probe, Francis Schmitz, voted for Scott Walker in 2012, was on George W. Bush's shortlist to be named the chief federal prosecutor in the state as U.S. attorney, and has been a member of the Republican Party. Schmitz, who is the named defendant in WCFG's federal challenge to the probe, submitted a sworn affidavit to the federal court stating that he has no animus towards Walker or other Republicans, and in fact generally supports Walker's policies." On May 6, federal Judge Rudolph Randa issued a preliminary injunction halting the probe, holding that not only do Wisconsin statutes not bar coordination over "issue ads," but that any effort to limit such coordination would violate the First Amendment. Randa also ordered the destruction of evidence gathered tin the criminal investigation, but the Seventh Circuit quickly blocked that order. In another editorial, the Journal Sentinel wrote, "the end of a coordination ban would create a 'dark' system of campaign funding." ""The entire election campaign could be conducted in secret. Money raised for the campaign could be funneled into tax-exempt 'social welfare' groups that don't have to disclose their donors, meaning voters would have even less of a chance than they do today of weighing potential motivations. How can the public know who a politician is working for if voters can't tell who is paying for an election?" "According to data from the Wisconsin Democracy Campaign, Wisconsin Club for Growth spent at least $1,615,860 on the last four Supreme Court races. Citizens for a Strong America, which is entirely funded by Wisconsin Club for Growth, spent $836,000 supporting Justice David Prosser's reelection in 2011, which he won by just 7,000 votes; in that race, Citizens for a Strong America alone spent more than Prosser's own campaign." "Although the Wisconsin Supreme Court has grown notorious for its lax recusal practices, the level of spending by the groups in this case -- and their direct stake in the outcome -- could demand recusal under the U.S. Constitution, following the 2009 U.S. Supreme Court decision in Caperton v. Massey. In that case, the U.S. Supreme Court held that a West Virginia Supreme Court justice should have recused himself from a decision involving a major campaign contributor." "'This could be a landmark case for applying the Caperton standards,' Matthew Menendez, counsel at the Brennan Center for Justice, told the Center for Media and Democracy." The Center to Protect Patient Rights (CPPR) gave $225,000 to WCFG in 2011. The New York Times described CPPR as "one of the largest political nonprofits in the country, serving as a conduit for tens of millions of dollars in political spending, much of it raised by the Kochs and their political operation and spent by other nonprofits active in the 2010 and 2012 elections." CPPR, in turn, received most of its funding from another Koch-connected organization called "Freedom Partners. CPPR is also a dark money conduit, donating to many of the same Koch-related non-profits as the Wellspring Committee." The Wellspring Committee donated $400,000 in 2011. According to the Center for Responsive Politics, Wellspring was created to allow donors concerned with protecting their anonymity a method to write "a check to a non-disclosing group that'll turn around and give the funds to another non-disclosing group." WellSpring is little more than a mailbox, essentially serving as dark money conduit that offers donors a way to secretly funnel money to politically-active groups. WCFG received $988,000 from the "action" wing of Wisconsin Manufacturers and Commerce (WMC), which is the state chapter of the U.S. Chamber of Commerce. WMC has also received hundreds of thousands of dollars from Wellspring Committee in recent years. Additionally, WMC was a major Walker supporter that spent $4.7 million on the Wisconsin recalls. It was also one of the groups named in the John Doe investigation, along with WCG. The mining company Gogebic Taconite contributed $700,000 to WCFG in 2011 and 2012, as shown by documents accidentally released in August 2014 as part of the unsealing of court documents related to an ongoing John Doe investigation. At the time, Gogebic was seeking approval for a controversial open pit iron mine in northern Wisconsin. According to the Milwaukee Journal Sentinel, an investigator for the prosecution said, "Because Wisconsin Club for Growth's fundraising and expenditures were being coordinated with Scott Walker's agents at the time of Gogebic's donation, there is certainly an appearance of corruption in light of the resulting legislation from which it benefited." Walker has denied that he had a role in soliciting the donation. Metropolitan Milwaukee Association of Commerce: "nearly $580,000"
WCFG spent over half of its 2012 budget on grants to other organizations, most of which spent spent millions advocating for Wisconsin Gov. Scott Walker and other Republicans during the 2012 Wisconsin recall elections. In 2011 and 2011, WCFG provided almost the entire budget for Citizens for a Strong America (CSA), giving CSA over $6.2 million over two years. CSA, in turn, spent millions on the 2011 and 2012 Wisconsin recall elections, and made transfers to other groups active during the recalls. Wisconsin Family Action, an anti-abortion and anti-gay marriage group, received $916,045 from the Wisconsin Club for Growth-funded CSA in 2011 and an additional $253,000 in 2012; the 2011 donation amounted to 90% of the grants that Wisconsin Family Action received that year. Wisconsin Family Action spent an estimated $850,000 on the recall elections. Another group, United Sportsmen of Wisconsin, received $235,000 from CSA in 2011. United Sportsmen was the subject of controversy in early 2013, when it was revealed that outgoing Assembly Majority leader Scott Suder (a former ALEC State Chair) slipped a half-million dollar, renewable grant into the Wisconsin budget that was later called a "sweetheart deal" for the group. Wisconsin industrialist Terry Kohler, a top donor to Republicans in the state and nationally, personally reached out to lawmakers on the budget committee and urged their support for the grant. In January 2014, the Milwaukee Journal Sentinel confirmed that the donation from CSA was the sole source of funding for United Sportsmen in 2011. This means that Club for Growth Wisconsin was effectively the sole funder for the controversial group, with CSA acting as a middleman. In 2012, CSA's largest contribution was $500,000 given to the Healthcare Compact Alliance, a project of Competitive Governance Action--whose board of directors includes WCFG director Eric O'Keefe. Mother Jones reported in 2011 that the Healthcare Compact Alliance had donated a significant amount to Tea Party Patriots. JFC has close ties to disgraced former Assembly Majority Leader Scott Jensen, who was the ALEC state chair for Wisconsin as a legislator. JFC in turn donated $245,000 in 2011 to Jensen's other group, the American Federation for Children. In the 2012 gubernatorial recall race, American Federation for Children reported spending $1.1. million in support of Governor Scott Walker's recall campaign, making it one of his top PAC supporters. The organization also reported spending $1.3 million to help GOP Senators who faced recall in 2011. In 2012, WCFG gave almost $3 million to the political arm of Wisconsin Manufacturers and Commerce, the WMC Issues Mobilization Committee, providing about 45% of the group's revenue for that year. WMC then spent $4 million on its pro-Walker campaign during the recall. Over the period from 2006 to 2009, the Coalition for America's Families (CAF) received a total of $2,692,000 in grants from the Wisconsin Club for Growth. The largest sum given to CAF by WCFG during that interval was $2,070,000 in 2008. 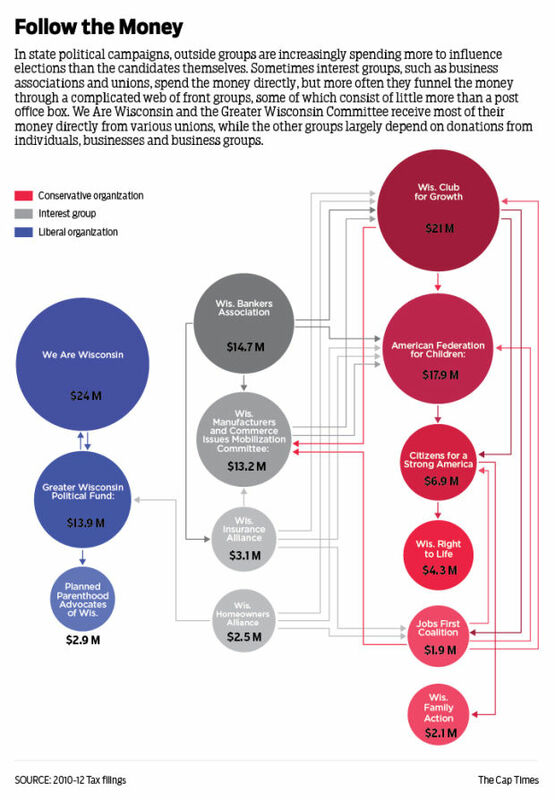 According to the Wisconsin Democracy Campaign, the Coalition is a dark money, electioneering group made up of conservative non-profit organizations and business who support low taxes, school voucher programs, few regulations on firearms, and oppose abortion. The association is based in Virginia and backs Republican candidates for office with fake issue ads directed at opposing candidates. The head of the Coalition for America's Families, Steve King, is the former head of the Wisconsin Republican Party. The CAF spent hundreds of thousands of dollars in 2008 supporting Republican candidates in state races, including $500,000 given to the campaign of Mike Gableman for State Supreme Court. They were also active in the 2006 general election where, according to the Wisconsin Democracy Campaign, they expended upwards of $1 million "on negative electioneering in statewide races and in support of a constitutional amendment against gay marriage." R.J. Johnson, a political strategist for (and close ally of) Wisconsin Governor Scott Walker, is a key adviser to the Club for Growth Wisconsin. Walker’s campaign paid R.J. Johnson and Associates more than $130,000 between July 2009 and January 2012. In the 2008 tax year, R.J. Johnson's eponymous consulting business made $33,791 on activities performed for the Club for Growth Wisconsin. A closer read of Walker’s book reveals that Johnson was advising the new governor at the same time Johnson was defending Club for Growth in the press. “Not long after the unions made their announcement [on Feb. 18, 2011], my chief political strategist, R.J. Johnson, took me aside and said, ‘Governor, you’re in trouble,’” Walker wrote in Unintimidated about his dismal poll numbers. Although campaign finance statements show that Walker’s payments to Johnson stop in January 2012, Johnson appears in Walker’s book on the night he won his recall in June 2012. It seems that Walker’s wife, Tonette, wouldn’t believe that Walker won the election until Johnson, watching the voting results in Walker’s “war room,” confirmed it. During the February, 2011 battle in Wisconsin over Republican Governor Scott Walker's "budget repair bill, the Club for Growth Wisconsin sponsored a black-and-white television ad that featured working-class faces and superimposed newspaper headlines about the economic downturn which asserted that public employees have made no sacrifices while ordinary people have suffered substantially. The ad cited concessions by workers at Harley-Davidson, Mercury Marine and Sub-Zero while somber music played in the background. The narrator intoned: "But state workers haven't had to sacrifice. They pay next to nothing for their pensions, and a fraction of their health care. It's not fair. Call your state legislator and tell them to vote for Gov. Walker's budget repair bill. It's time state employees paid their fair share, just like the rest of us." PolitiFact Wisconsin reported that "officials with the Club for Growth -- Deb Jordahl and R.J. Johnson -- told us the ad meant to highlight just two issues regarding state employee compensation: pension and health care payments.... The portion of health premiums paid by employees more than doubled under then-Gov. Jim Doyle, from 2.5 percent to 5.6 percent in 2011.... But the most notable change for state workers has come on pay. "The Club for Growth ad dramatically highlights 'frozen wages' and 'pay cuts' accepted by unions at the private companies -- and then says 'state workers haven’t had to sacrifice.' In fact, state workers have taken a hit on wages -- in the form of furlough days.... Doyle also rescinded 2 percent raises for non-union employees in the 2007-2009 state budget.... Doyle also suspended merit awards in November 2008.... So state workers have in fact given up some pay, which is the definition of sacrifice." The Milwaukee Journal-Sentinel reported that in the first month after Walker's budget repair bill was introduced, WCFG had spent $805,610 on broadcast TV ads over Wisconsin's budget fight. During the Wisconsin Supreme Court race in March of 2011, WCFG also ran four ads promoting Walker’s budget reforms and endorsing Supreme Court Justice David Prosser; that race was treated as a referendum on Walker's controversial union bill. WCFG spent over $400,000 supporting Prosser’s campaign. Club for Growth Wisconsin spent more than $1 million on outside electioneering activities in the 2007 and 2008 state Supreme Court races and the 2008 and 2010 fall elections. The Club for Growth Wisconsin was the first outside special interest group to promote a candidate in the 2011 Wisconsin Supreme Court race, spending at least $321,000 on the race, and out-spending all candidates combined, and accounting for 70% of all spending in the race. The group has hired the Republican polling firm, Public Opinion Strategies, to health defeat efforts to obtain universal health insurance in Wisconsin. "Club for Growth Wisconsin spent an estimated $950,000 on negative broadcast advertising and other electioneering activities in the 2007 and 2008 Wisconsin Supreme Court races and the 2008 fall elections," according to Wisconsin Democracy Campaign. "The group sponsored a radio ad about three weeks before the November 2010 elections against Democrat Elmer Monk of Kimberly, who is running for the 1st Senate District open seat against Republican Frank Lasee. The ad criticized Monk for voting to raise property taxes as Kimberly school board member." The Club for Growth Wisconsin supports and works to advance tort reform, a "movement" propagated by companies and entire industries -- such as the tobacco and asbestos industries -- that are vulnerable to legal actions seeking damages for the impacts of their products. Proponents use the term "tort reform" to refer to legislative measures designed to limit the ability of individuals to sue companies and to restrict the amount of potential damages available to individuals who take legal actions against companies. "in 2004, after serving on the board of directors for the [national] Club for Growth for several years, Eric [O'Keefe] encouraged people involved with the Club for Growth to support similar efforts at the state level, as part of an accountability infrastructure. The national Club charted state chapters in seven or eight states before losing enthusiasm for the project. The chapter in Pennsylvania achieved early success, but later idled. Kansas has a Club which had a notably influential year in 2012." Wisconsin Club for Growth, 2013 IRS Form 990, August 15, 2014. Wisconsin Club for Growth, 2012 IRS Form 990, November 14, 2013. Wisconsin Club for Growth, 2011 IRS Form 990, November 15, 2012. Wisconsin Club for Growth, 2010 IRS Form 990, November 15, 2011. Wisconsin Club for Growth, 2009 IRS Form 990, November 12, 2010. Wisconsin Club for Growth, 2008 IRS Form 990, November 13, 2009. Wisconsin Club for Growth Inc.
Ed Pilkington and the Guardian US interactive team, Leaked court documents from ‘John Doe investigation’ in Wisconsin lay bare pervasive influence of corporate cash on modern US elections, The Guardian, September 14, 2016. 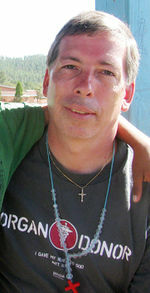 Arn Pearson, Leaked Documents Show Court's Dismissal of the John Doe Was Based on a False Premise, PRWatch.org, September 22, 2016. Mary Bottari, Supreme Cover-Up: How the Wisconsin Justice System Failed in the Walker John Doe, PRWatch.org, September 18, 2016. Mary Bottari, Scott Walker John Doe: Corporate Checks Fueled Coordinated Campaign, PRWatch.org, September 15, 2016. Lisa Graves, CMD Urges U.S. Supreme Court to Hear Prosecutors' Appeal in John Doe II Corruption Case, PRWatch.org, June 23, 2016. CMD Reporting on Walker Dark Money Criminal Probe, PRWatch.org, September 9, 2014. ↑ Wisconsin Department of Financial Institutions, Wisconsin Club for Growth, Inc. organizational website, accessed on April 26, 2016. ↑ Patrick Marley, Daniel Bice, Bill Glauber, John Doe prosecutors allege Scott Walker at center of 'criminal scheme', Milwaukee Journal Sentinel, June 19, 2014. ↑ Wall Street Journal editorial board, Wisconsin Political Speech Raid, Nov. 18, 2013. ↑ The Wall Street Journal, Review & Outlook: Wisconsin Political Speech Raid, The Wall Street Journal, November 18, 2013. ↑ Daniel Bice and Dave Umhoefer, Secret ruling deals major setback to John Doe probe into recall elections, Milwaukee Journal Sentinel, Jan. 10, 2014. ↑ Brendan Fischer, Secret Court Ruling Could Undermine Wisconsin Campaign Finance Law, PRwatch.org, Jan. 28, 2014. ↑ Mary Bottari, "Secret Money Advocates Prepare to Unload on Milwaukee DA John Chisholm", PRWatch.org, April 28, 2016. ↑ 14.0 14.1 14.2 14.3 14.4 Katelyn Ferral, "Updated: Federal judge rules against former Scott Walker aide in civil suit, allows John Doe evidence to be preserved", The Cap Times, May 27, 2016. ↑ 15.0 15.1 Shawn Johnson, "Judge Throws Out Former Walker Aide's John Doe Lawsuit", Wisconsin Public Radio News, May 26, 2016. ↑ 16.0 16.1 16.2 16.3 Mark Sommerhauser, "Wisconsin Club for Growth, GAB reach settlement in John Doe suit", Wisconsin State Journal, December 18, 2015. ↑ 17.0 17.1 17.2 Government Accountability Board of Wisconsin, "Statement on Settlement of Litigation with Eric O’Keefe and Wisconsin Club for Growth", GAB Website, December 17, 2015. ↑ Patrick Marley and Jason Stein, Wisconsin Club for Growth sues to shut down John Doe investigation, Milwaukee Journal Sentinel, Feb. 10, 2014. ↑ Brendan Fischer, Top Six Facts in the Walker Dark Money Criminal Probe, PRwatch.org, May 13, 2014. ↑ Brendan Fischer, Partisan Witchhunt Claims from Club for Growth Upended by New Court Filings, PRwatch.org, Apr. 22, 2014. ↑ Brendan Fischer, Selective Targeting Claims in John Doe Filings Fall Flat, PRwatch.org, Mar. 24, 2014. ↑ Milwaukee Journal Sentinel, Judge Rudolph Randa's ruling on the John Doe probe is premature, editorial, May 10, 2014. ↑ Milwaukee Journal Sentinel, Gov. Scott Walker and His Allies Should Be Careful What They Wish For, June 20, 2014. ↑ Brendan Fischer, Federal Judge Who Halted Walker Dark Money Criminal Probe Attended Koch-Backed Judicial Junkets, PRwatch.org, May 27, 2014. ↑ Steven Elbow, Experts weigh in on John Doe judge's Koch-funded 'judicial junkets', Capital Times, May 30, 2014. ↑ Jason Stein and Bill Glauber, Club for Growth sues to force GAB out of Doe probe, Milwaukee Journal Sentinel, May 30, 2014. ↑ Brendan Fischer, WI Club for Growth Tries to Bar GAB from Spending Money to Probe Illegal Campaign Spending, PRwatch.org, June 2, 2014. ↑ Patrick Marley, John Doe probe raises issue of potential conflicts with justices, April 28, 2014. ↑ Brendan Fischer, Supreme Court Challenge to WI Dark Money Probe Raises Questions of Judicial Ethics, PRwatch.org, Feb. 19, 2014. ↑ 32.0 32.1 Patrick Marley, Daniel Bice and Lee Bergquist, "Walker wanted funds funneled to Wisconsin Club for Growth," Milwaukee Journal-Sentinel, August 22, 2014. Accessed September 2, 2014. ↑ Lee Bergquist, "Mining company, allies spent freely to get bill approved," Milwaukee Journal Sentinel]], September 1, 2014. Accessed September 2, 2014. ↑ Patrick Marley, "As lawyers prep for John Doe hearing, legal tab tops $672,000," Milwaukee Journal Sentinel, September 9, 2014. Accessed September 10, 2014. ↑ 35.0 35.1 35.2 35.3 35.4 Lisa Kaiser, "Who Was Wisconsin Club for Growth's $1 Million Donor?," Express Milwaukee, April 2, 2014. Accessed June 16, 2014. ↑ Brendan Fischer, Why Are the Franklin Center's "Wisconsin Reporter" and "Watchdog.org" Attacking the John Doe?, PRwatch.org, Dec. 19, 2014. ↑ Health Care Compact, About, organizational website, accessed June 16, 2014. ↑ Guidestar, Competitive Governance Action, People and Governance, accessed June 16, 2014. ↑ Stephanie Mencimer, "The Tea Party's Latest Scheme to Kill Health Reform," Mother Jones, March 29, 2011. Accessed June 17, 2014. ↑ Jack Craver, "Dark money: How Wisconsin's most politically influential organizations avoid disclosing their donors," January 15, 2014. Accessed June 16, 2014. ↑ ProPublica, "Wisconsin Club for Growth Form 990 Returns", organizational website, Accessed June 22, 2016. ↑ 45.0 45.1 Wisconsin Democracy Campaign, "Hijacking Campaign 2008", organizational website, Accessed June 22, 2016. ↑ Brendan Fischer, "Kohler Heir and Walker Backer Plumbs Dark Money Depths", The Center for Media and Democracy, November 5, 2013. ↑ Wisconsin Club for Growth, 2014 IRS form 990, organizational tax filing, accessed June 23, 2015. ↑ Wisconsin Club for Growth, 2013 IRS form 990, organizational tax filing, accessed July 13, 2015. ↑ Wisconsin Club for Growth, 2012 IRS form 990, organizational tax filing, accessed July 9, 2014. ↑ Wisconsin Club for Growth, 2011 IRS form 990, organizational tax filing, accessed July 9, 2014. ↑ Wisconsin Club for Growth, "990 2011 Center to Protect Patient Rights", organizational database, Accessed June 23, 2016. ↑ Wisconsin Club for Growth, "990 2011 The Wellspring Committee", organizational form 990, Accessed June 23, 2016. ↑ Wisconsin Club for Growth, 2010 IRS form 990, organizational tax filing, accessed July 9, 2014. ↑ Wisconsin Club for Growth, 2009 IRS form 990, organizational tax filing, accessed June 21, 2016. ↑ Wisconsin Club for Growth, 2008 IRS form 990, organizational tax filing, accessed June 21, 2016. ↑ Wisconsin Club for Growth, 2007 IRS form 990, organizational tax filing, accessed June 21, 2016. ↑ Wisconsin Club for Growth, 2006 IRS form 990, organizational tax filing, accessed June 21, 2016. ↑ 60.0 60.1 Lisa Kaiser, John Doe #2 Looking at Walker’s Campaign Committee and Dozens of Conservative Groups, Shepherd Express, Nov. 20, 2013. ↑ Eric-OKeefe.com, "About Eric", accessed December 23, 2013. ↑ Wall Street Journal editorial board, Wisconsin Political Speech Raid, Nov. 18, 2013, Wall Street Journal. ↑ Wisconsin Club for Growth Benefits YouTube, Feb. 14, 2011. ↑ Club For Growth Update Facebook, Feb. 16, 2011. ↑ Club For Growth Update Facebook, Feb. 14, 2011. This page was last edited on 17 December 2018, at 22:24.